The Pow Wow Network is a group of sites focused on Native Americans. Starting with PowWows.com in 1996, the network has grown to include 8 sites, over 35,000 registered members, and more than 200,000 daily pages views. 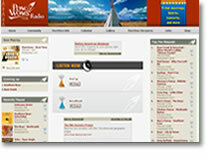 This network of sites features the most popular Native American sites online! PowWows.com is your source for all things Pow Wow since 1996. PowWows.com features an active community of over 25,000 users. The site includes photo galleries, videos, forums, Pow Wow Calendar, Links, Pow Wow Resoures, Radio, and more. MyTribalSpace.com is the ALL Native MySpace! Find friends, search for classmates, browse bands, and more. The features also includ creating your own profile, uploading photos, and posting in your own blog. Listen to over 1,200 Pow Wow songs online, make requests and send dedications on our 24/7, Free, Internet Radio Station. 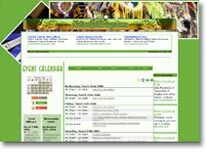 NativeGatherings.com is your online calendar for all Native American events! The calendar includes concerts, sporting events, art shows, tribal meetings, Pow Wows, and more. Watch over 250 videos from Pow Wow around the country. You can also view rebroadcasts of our webcasts. Search for photos to use for newspaper and magazine articles. PowWowImages.com features photos taken from Red Earth, Gathering of Nations, Schmetizun, NMAI, and other events. 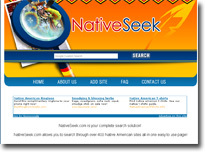 Your online directory to find Natives on MySpace, Facebook, MyTribalSpace.com and other social sites. Your custom search engine for ALL Native sites. Search for information through a database of over 450 sites including Indianz.com, Indian Country Today, Gathering of Nations, PowWows.com, and more. Move your Pow Wow into the next century by making it an ePow Wow! Bring your Pow Wow and other live events into the digital age by using PowWows.com's ePow Wow services. PowWowScoop.com is a way to stay up to date with Pow Wows from across Indian Country! By using the power of Twitter, you can now view posts from people at different Pow Wows!